Biology and Computer Science majors collaborated to design and implement algorithms to model a genomic-level process: the evolution of protein-coding genes. Students had to combine their respective expertise in biology and computer science in order to successfully model this process. We used a pedagogical approach that starts with a biological question that requires a computational approach to solve. The instructors provided students with partial "starter code" that implemented part of the algorithm. Students refined and elaborated/simplified the code to more accurately model the process. They compared their output to empirical data (an alignment of HSP70 protein sequences) to determine which most closely matched their model. For the collaboration: To become familiar with modeling a biological process: requires "abstracting away" features of the biology; a simple model must be constructed and tested first. Students are given an assignment to acquire protein sequences from several genomic databases, then conduct sequence alignments using clustal. Discussion of the biology:Students discuss what they know about how DNA and protein sequences change over time, and the class discusses the process of DNA mutation, which is presented in the textbook as a primarily random process. The biology students, however, should be able to contribute information that the pattern of nucleotide substitution is probably not random, because alternation of an amino acid might affect the function of a protein, so the nucleotides that are most likely to vary are those in the the position of codons. Class discusses how the process of mutation may be random, but the process of selection will prevent most amino-acid altering substitutions from persisting. Discussion of the algorithm:How might we model how protein evolution might look under two different scenarios: a random vs targeted nucleotide substitution approach. The Bio/CS pairs are given "starter code" that they must further modify and develop to model the effect of a random vs. targeted substitution on the the human Heat Shock Protein 70 (HSP70). The goal: use extant protein-coding genes to provide evidence to support or refute the students' attempts to model the evolution of protein-coding genes. Compare the diversity statistics with the two models to assess whether one model more closely mirrors the evolution of the HSP70 gene. 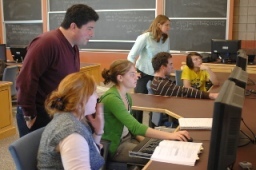 This teaching activity was developed in the context of an upper level team-taught course (computer science and biology). Define a biological question or problem for the students to address. In this case, the problem to address was evolution of protein-coding DNA sequences. We provided the students with "starter code" that did part of the job, or it was a first attempt at doing the job. The students had to run and study the code and either improve the code or refine their original biological question or, usually, both. To be successful, they had to collaborate, because they needed expertise in both the Bio and CS. The whole was greater than the sum of its parts. can a computer really implement a truly random function? How is a single alignment chosen from among all the possible ways to line up two or more sequences? What are gaps and what do they represent? What does it mean biologically if a particular amino acid is present at the same position in all the sequences? What do we mean by "random"? Do we select one of the 4 nucleotides randomly? what about if we replace a nucleotide with itself? should we model insertions and deletions? Week 3: Assessing the models by comparing substitutions in a homologs of HSP70 in metazoa. does clustal ensure that the reading frame is not thrown off? No! Why? Bioinformatics computing cluster (16 core Linux, SunGrid Engine) with a suite of open source bioinformatics tools (via iNquiry). However, this module could be done entirely making use of open source web-based tools (clustalw) as well as any system that can run code (such as linux or dos).